Finance is a very different world from what it was just a few years ago. Today finance functions have to look at how the whole of the organization – and beyond – impacts the bottom line. We've shaped a global ecosystem of CFOs, controllers and other accounting and finance executives to help you enhance the value that you're adding to your enterprise. We're inspired to ask better questions. And we work with you to create more innovative answers, collaborating across the organization, helping you improve finance and accounting processes and delivering the technology to help make it happen. Our global connectivity means we can combine deep operational consulting capability with industry-specific leading practices. We have alliances with sector-leading businesses such as SAP, so you get the benefits of their insight. This ongoing collaboration means, together, we can support better outcomes and long-lasting results. How can a cultural transformation lead to operational savings? We helped a financial services media company work better by helping it transform its source-to-pay operation, enabling it to achieve double-figure millions in run-rate savings in the first three years post-implementation. Can a company that moves money save money too? We helped a multibillion dollar security and logistics company work better by helping it integrate more than a dozen financial systems into one ERP platform, reducing overall financial costs by 66% and headcount by 55%. When organizations migrate, do they need a map? We helped a global industrial products company work better by helping it define its migration plan as part of a global transformation project to align, simplify and harmonize its processes. When finance functions transform, can they electrify the bottom line? We helped a global power and utility company work better by helping it realize the benefit of millions of dollars with its launch of a major finance transformation project that included designing a two-hub SSC structure. From a technical standpoint, how do you drive savings to your bottom line? We helped a global technology company work better by assisting in the design and implementation of a new finance operating model with anticipated annual savings of US$35m. How do you advertise for a fresh approach? We helped a leading advertising agency work better, following a series of acquisitions, by helping it to consolidate and streamline its operations, establishing shared service centers around the world and improving benefit realization. How quickly can you decide to improve your planning process? We helped a leading Indian brewer work better by helping it develop and implement flexible and interlinked planning tools and processes that enabled it to reach decisions more rapidly and with more robust information. How do you measure the results of your success? We helped a professional services firm work better by enabling it to measure and track the benefits resulting from a global ERP implementation and finance transformation. We choose the right people and bring the best thinking to your issues. We offer a strong mix of sector, market and technical professionals both within EY and beyond. This encompasses our consultants, clients, alliances and other EY Finance professionals in areas such as Tax, Assurance and Transaction Advisory Services. In every engagement, we adapt our methodology, and delivery to suit how you want to work. We help you capitalize on opportunities to drive profitable growth, rethink organizational structure and reap the potential of information. We bring you finance and accounting technical knowledge, as well as the capability to think broadly about the business issues, and then the practical skills to help deliver better business outcomes. For example, we can help you adapt to and benefit from new technologies that are driving transformation, such as HANA in-memory computing. We can help you develop more captive, shared and back-office services, as well as build, operate and transfer outsourcing services to deliver more implementation potential. And we can help rethink what you do with data to extract valuable business insights from it, securely. Above all, in every engagement, we adapt our methodology, and delivery to suit how you want to work. For example, marrying the program change and financial management skills needed for large transformations. And we continually evolve our services to meet your changing needs, such as delivering assessment and benchmarking services online in a subscription model. For EY Advisory, a better working world means solving big, complex industry issues and capitalizing on opportunities to help deliver outcomes that grow, optimize and protect our clients' businesses now and in the future. Making changes in one tiny area can make a huge, positive difference overall. A well-run finance process is at the core of a successful CFO. It enables innovation by freeing up scarce resources to focus on what’s important. Yesterday’s finance transformation focused primarily on cost control, process efficiencies, and establishing the right controls and risk-management procedures. Today, it is that and much more. Like the CFO position itself, the finance function has evolved and taken on new dimensions supporting corporate strategy, the capital agenda, growth and competitive advantage in the marketplace. As growth has returned to the business agenda of many companies, innovation is taking the place of cost-control and efficiency as a priority for many CFOs. Leading companies recognize innovation is everyone’s responsibility, championedby the leadership team, including the CFO. A well-run Finance process enables innovation by freeing up scarce resources to focus on important questions and solve difficult problems. Process efficiency reviews, including the design of metrics to improve process effectiveness and efficiency. Technology enablement which allows the finance process to reach its full potential. People Excellence helps map finance's current skill set, identify opportunities for improvement and execute the roadmap to prepare the finance team for the future. CFOs often question whether their finance staff members are fully capable of performing their duties today and are prepared for the future. They lie awake at night wondering if they fully leverage the scarce human capital in their organizations. At EY, we believe we can address this challenge. Our People Excellence service offering makes a targeted effort to map finance’s current skill set, identify opportunities for improvement and help execute the roadmap to prepare the finance team for the future. From there, we help clients develop the learning and development capability required to invest in finance teams, prepare them for the future and sustain improvements. We also help clients define and implement the talentmanagement processes required to achieve their vision. Learning and development is a journey, not a destination. It takes a proven, repeatable process with continuous engagement of the finance function and an advisor who knows how to get it right. We can help finance align more closely with other functions and develop a mutual understanding of risks and opportunities. At EY we understand the controller function and what it takes to balance the books, maintain control of the financials, mitigate financial risks, drive insight and do it all with an efficient team. However, we recognize that successful finance leaders look beyond this traditional finance perspective and are collaborating more closely with other internal functions for business planning and strategic decisions — not just from a monitoring, reporting and risk management perspective. We can help finance become a trusted business partner, bringing closer alignment between finance and other functions, and a mutual understanding of key risks and opportunities. We are also passionate about looking across industries for bestin breed practices and bringing those tools to our clients, to make them faster, smarter and with less risk. EY’s Finance Controlling Excellence offering brings together all of the key elements of an effective controllership function: people, process, policy, technology and delivery model, while promoting strong partnership between finance and the business. We leverage our Finance Controlling Excellence offering to ensure our clients’ finance group can successfully support the strategic direction. We help clients build global target operating models, adapted from leading practices for their own uniqueness. We leverage leading class technology such as SAP Simple Finance to drive the data, analytics and insights required to manage the business. This technology can revolutionize finance as it provides ‘instant insight’ based on real-time information, such as integrated planning, continuous processing, and predictive forecasting. We design and implement finance delivery models to build the scale and consistency required to manage an ever increasingly complex landscape. And we do it all with an eye on risk and costs to minimize the burden on your business. At EY we understand both the global standards and local complexities required of the controllership function. We help clients manage this balance all over the world. The journey is never over. Future delivery models are global, multifunctional and fully integrated. We help to determine your current maturity and how to transform. Many organizations already have been implementing shared services and outsourcing in the last two decades. Finance led the way, followed by IT, focused on the handling of non-core company activities. Tomorrow’s model for Global Business Services (GBS) is multifunctional, fully integrated, end-to-end process oriented and helps to transform your business. Typically, this is achieved through the creation of a unified GBS unit capable of managing end-to-end processes. The move toward a Global Business Services organization is a process of evolution rather than revolution and from today’s perspective — ‘end-to-end’ Global Business Services are the end-point for this evolution. So far at least, very few companies have reached this level of integration. Our Global Finance Delivery Excellence service offering addresses all levels on this journey: The setup of Finance Shared Services, the migration from Finance to Multifunctional and Regional Shared Services, as well as the migration from Multifunctional Shared Services to a truly ‘end-to-end’ GBS organization including Center of Excellence (CoE) structures. We focus not only on the benefits to the individual function, but also how to contribute to corporate objectives and take a more strategic position in the enterprise-wide operating model. We can help you determine the current maturity of your GBS journey in six dimensions: strategy, organization and location, service scope and maturity, migration and improvement, processes and automation as well as people and talent. GBS fosters a commercially oriented culture and balances cost reduction targets with investments for process innovation. GBS is run as a full business unit with P&L responsibility and skill development and attraction of talent is a key to success for the new generation of Shared Services. We are working with our Supply Chain & Operations, People Advisory Services, Technology, Customer, Risk as well as Human Capital and Tax teams to offer you these services consistently across functions, across the globe and in a fully integrated way.Our innovative ‘Build-Operate-Transfer’ approach can allow you to establish GBS more quickly and with reduced risk. How are you performing against your peers? Incorporate Benchmarking as a business performance management tool to understand how you are performing against your peers. Leveraging Benchmarking helps clients to design and implement a program to calculate business performance, compare to industry or other relevant standards, and identify key findings and opportunities for improvement. Using the benchmarking repository with over 50,000 analysis points with deep datasets across several sectors, enables fact-based decision making. 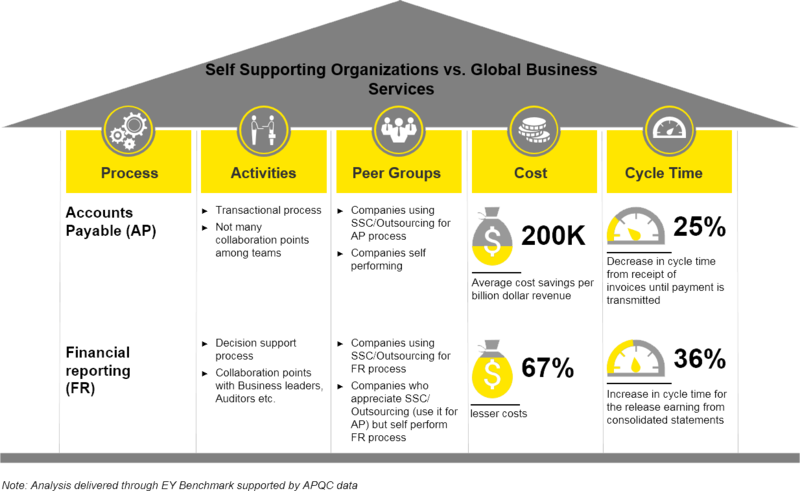 Below is a sample of EY’s finance benchmarking capability that depicts a high-level comparison of costs, cycle time and productivity ratios when you are moving from a self-supporting unit to Global Business Services for two of the Finance processes: Accounts Payable and Financial Reporting. How can you achieve profitable growth? Should you maximize revenues or minimize costs? Have you got the right talent and structure in place to achieve what you need to? Are you really getting all the potential value from the information you have? Are you staying on the right side of regulations?